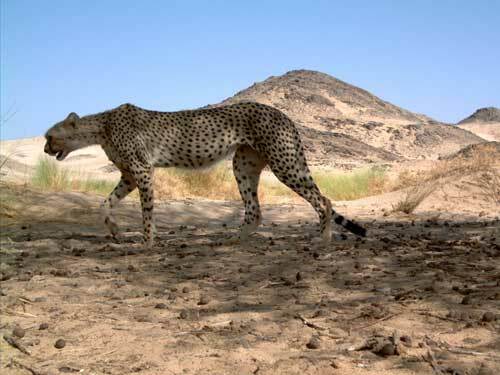 Using motion-triggered cameras developed for surveillance, a team of researchers in Algeria has captured the first photographs of a nearly-legendary variety of cheetah, believed to be one of only 250 Saharan cheetahs left on Earth. Sarah Durant, a zoologist based in London, worked with the Office du Parc National de l'Ahaggar (OPNA) to track the endangered creatures. The group placed cameras throughout a 2800-square kilometer area in the Sahara which snap photos when they detect motion. 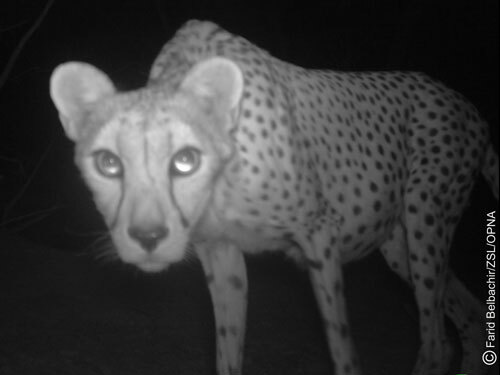 It's a technique called a "camera trap survey," and it's been used quite frequently in recent years to track human-shy creatures such as the Saharan cheetah. Because these cheetahs have distinctive spot patterns, Durant and her group were able to say that they'd gotten images of four separate Saharan cheetahs. Like other cheetahs, these big cats are lanky, fast runners who tend to live alone. Durant told New Scientist, "Virtually nothing is known about the population." The camera trap survey may reveal more in coming months.